It’s October and that means its the beginning of Frightful Fall. 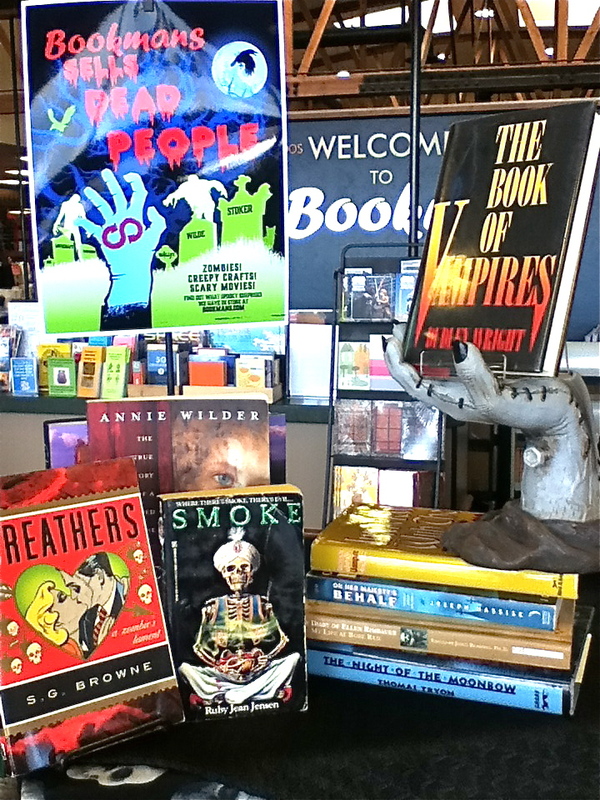 Full of goblins, ghouls and ghosts, Bookmans rejoices in the chance to celebrate the spooky. The genre of Horror is often underrated. It’s a Bookmans favorite. Rarely are we scared by a book, but it has happened. October is the perfect time to highlight the best of Horror. Check out these four spooky reads and give us your take on the best spooky stories in the comment section. This is an important read from a literary perspective given that it is regarded as the first, and one of the best gothic novels. Published in 1764, the story has an interesting background all on it’s own. This tale about Lord Manfred opens with his sickly son’s wedding. From there stuff gets messy, literally. The book includes much intrigue, betrayal, death and bodice ripping. The story ultimately influenced many horror masters such as Bram Stoker, Edgar Allan Poe and Ann Radcliffe. Those who discovered this series in the 80’s were unhindered by future Anne Rice tales or film adaptations. In the seminal tale, a vampire named Lestat tells his life story to a young boy. This work is powerful in its straightforward and plainly-stated style. Lestat’s narrative is so oddly believable and compelling that readers clamor for more of Lestat’s exploits. This led Rice to pen many other books in her Vampire Chronicles and allowed for the creation of an entire cast of vampire characters existing in an antiquated and richly compelling world. While Rice’s subsequent novels are good, some even great, she never again captured the intimacy and vibrancy of her initial work in Interview with a Vampire. Dani reports this is the most frightening work she has ever read. She found Hostage to the Devil by accident when it fell from a book shelf. The work is by Malachi Martin, a former Jesuit priest, exorcist, author, speaker and mentor to the famed psychologist M. Scott Peck, M.D. Hostage to the Devil covers the stories of five modern day Americans who were diagnosed as being demonically possessed. Martin gives credence to the stories by including much factual information and psychological insights into their conditions. The work includes the case studies of all five and includes the story of our main exorcist, Michael Strong, the handbook of exorcism and the manual of possession. Glimpses of the Devil by M. Scott Peck, M.D. Peck is best known for his works The Road Less Traveled and People of the Lie. In People of the Lie, Peck, a highly trained psychologist, writes of his research into the study of human evil, attempting to remove the supernatural and spiritual elements. While pursuing a rigorous clinical study, Peck stumbles across phenomenon he cannot explain. In his attempts to give psychological and medical explanations, he meets Malachi Martin. This relationship and the subsequent events are the basis for Glimpses of the Devil. If you are a fan of horror, these books are sure to please. Just leave the light on. These works are plenty frightening and for adults only. For kids, stick to the Goosebumps series for now. R.L. Stine knows how to cut the scary with humor. *Bookmans is your store to explore. We can’t guarantee stock so if you are interested in one of these Bookmans recommended spooky reads, please give us a call and we’ll check our orange shelves for you. Otherwise, we hope you will come and browse.